Let’s begin from the fact that the set phrase ‘the revolting South-East’ is rather a propaganda cliché than a reflection of reality. The wider ‘South-East’, or the so-called Novorossia, about which Putin began speaking publicly from the middle of 2014, has not, in fact, materialised. At the time this was first mentioned, the Kremlin propagandists spoke about eight or nine oblasts which would separate from the centre and become the counterweight to ‘historical Ukraine’ in the North-West of the country. In the majority of the potentially rebellious regions this project has foundered. As we can see, for Kagarlitsky peace can only come after the defeat of Kiev. By ‘equal determination’ we can surmise Putin’s idea of federalisation of Ukraine — The right of one region, governed by self-appointed opportunists, to impose its position on the vast majority of the population of Ukraine, which is categorically opposed to any closer relations with Russia. It is notable that at that point the leadership of the Donetsk People’s Republic (DNR) were Russian passport-holders. In other words, Russian imperialists would have received veto power in the internal and external politics of Ukraine. As we can see, in the text there is not only the Kremlin’s ideological clichés, but a call to use the ‘support’ of Russia. Note that the ‘editorial board’ of the site managed by Kagarlitsky points to the ‘self-organising movement of solidarity with Novorossia’ — here the author is stating something he himself simply cannot, in all honesty, believe. The main organisation that stands behind the wiping up of Russian military hysteria, the National-Liberation Movement, is not only an extreme rightwing nationalist group, but an organisation that receives money from the Kremlin and is led by Evgeny Fedorov — a Duma MP from the ruling United Russia party. In 2014, this good soldier of Putin became famous for calling for an assault on the remaining liberal media. Even before the crisis in Ukraine, he publicly put forward an initiative to withdraw from the Russian constitution the clause barring state ideology and the priority of international law above the Russian law, having called the Constitution a ‘colonial utilisation manual’. Fedorov’s assistant is a certain Andrey Kovalenko, who heads the Moscow branch of the far right organisation Eurasian Youth Union, which is part of the wider Eurasian Movement headed by Aleksandr Dugin, who became infamous for his earlier statement that ‘Ukrainians must be killed, killed, and killed; I tell you this as a professor’. Kovalenko’s organisation had received hefty financial support from the Kremlin long before the outbreak of the war. Instead of ‘self-organisation’ we see, in fact, a structure that unites the ‘ideological neighbours’ of Russian nationalists (this is the way the EYU is categorised by the human rights organisation ‘Sova’) and Russian paleo-conservatives under the wing of the Kremlin. Kovalenko himself has become celebrated for a video in which he calls on Putin to issue his command to ‘fetch’ (as to a dog — HC). Similarly, extreme rightwing and nationalist Liberal Democratic Party of Russia (LDPR) and Communist Party of Russia (KPRF) have become instrumental in such “self-organisation”. These parties declare their oppositionist credentials but have long since become part of the system of government. The leaders of these political parties, Zhirinovsky and Zyuganov, are playing the roles of raving lunatics who are meant to underline the relative sanity of Putin. In other words, the ‘editorial board’ of Rabkor.ru recommends supporting the Russian nationalists, who are ‘seemingly’ forcing the Kremlin’s hand towards intervention and military support. In other words, Kagarlitsky’s site is in effect calling for the support of a movement that is even more reactionary than the Kremlin. He is calling SPECIFICALLY for a military defeat of Ukraine. Is this really a way towards peace? Somehow it does not seem so. We can only imagine that Kagarlitsky, the refined intellectual, has been so deeply engaged in academic Marxist research that he simply is unable to notice the imperialist foreign policy, the fascism-infiltration of society and the managed nature of the militarist hysteria in Russia. Yet, it is difficult to agree that he does not know. Marxism is a materialist framework, which cannot ignore facts of political life, and must study them. High theory and ‘dialectics’, removed from practice, are signs of idealism; the machiavellian adjustment of reality to previously formulated conclusions points to ultimate subjectivism and an anti-scientific nature of any such theory. This may, in fact, be described as ideology (in Marxist terms), i.e. a form of false-consciousness. We are, therefore, not dealing with Marxism, but with plain-and-simple anti-Marxism. ’In Russia, however, Kagarlitsky prefers different company. …Kagarlitsky took part in a meeting of Russia’s far right Florian Geyer Club (Third Reich’s 8th SS Cavalry Division, which was deployed on the Eastern front in 1943–44 – HC), which is headed by a rightwing islamist Geydar Dzhemal. This Club is often frequented by Russian fascists, such as, for example, Aleksandr Dugin, Maksim Kalashnikov and Mikhail Leontiev, the Sweedish anti-Semite Israel Shamir and the Italian national-Maoist Claudio Mutti, among others. Kagarlitsky (and Richard Brenner) also took part in the conference ‘Global Crisis and the Conflict in Ukraine’, which took place in the recently annexed by Russia city of Yalta on 6–7 July 2014. One of the organisers of the conference was the Institute of Globalisation and Social Movements (founded and led by Kagarlitsky — HC). The other organiser of the conference — the extreme nationalist ’New Rus’’, headed by Alexey Anpilogov — recently hosted another conference, entitled ‘Russia, Ukraine, New Russia: Global Problems and Challenges’, which included among its invited guests such foreign fascists as Frank Kreilman (Flemish Interest), Luk Michel (Belgian far right national-Bolshevik party ‘Pati Communautaire National-Européen’), Márton Gyöngyösi (Hungarian extreme rightwing or neo-Nazi party Jobbik), Roberto Fiore (Italian extreme rightwing party ’Forza Nuova’), Mateusz Piskorski (Polish populist rightwing party Samoobrona), and Nick Griffin (the far right British National Party). (Although only Piskorski and Fiore managed to come on this occasion). 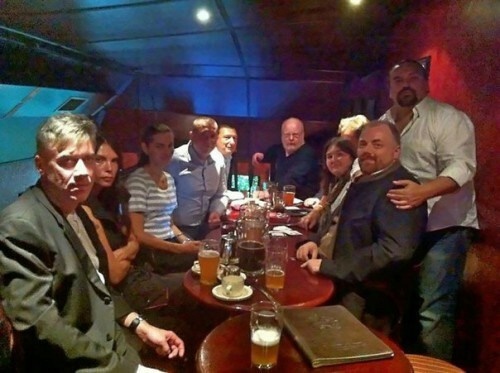 Last year Shekhovtsov also published in his blog a photo in which seated at the same table at a drinking establishment are Kagarlitsky with Alexey Belyaev-Gintovt (prominent member of Aleksandr Dugin’s International Eurasian Movement), Yevgeniy Zhilin (leader of the extreme rightwing militia Oplot), Konstantin Krylov (far right politician, one of the organisers of the Russian Social Movement — Russia), right-conservative publicist Yegor Kholmogorov and Ukrainian journalist Aleksandr Chalenko. The latter now lives in Moscow and calls for a full-scale Russian occupation of Ukraine, reassuring his Moscow interlocutors and readers that Ukrainians will not put up serious resistance and will quickly learn to live with the policies of the military forces. The main thing is to capture Kiev quickly enough. Kagarlitsky has been friendly with the hawks who propagate aggression and war, and it would not be unwise to assume he is a hawk. Moreover, the Institute of Globalisation and Social Movements, headed by him, is backed financially by the Russian government. Aside from the Institute, Presidential Grants were also given to the Centre for Political Technologies (the foundation tasked with developing the ‘conservatism for development’ doctrine), foundation St Petersburg Politics, and Institute for the Urban Economy. Apropos the category of ‘youth projects’, the most significant financing from the government has been allocated to the pro-Kremlin biker club Night Wolves. Russian national-socialism needs money, and the state of the property owners needs a reactionary ideology. The Kremlin hands out the money, but it does not need to call itself ‘conservative’. Selective blindness to the state’s true intentions is not a hindrance as long as what you do is provide the ruling party with what it needs and service those needs accordingly. Leftists engaged in this kind of game are not only not hampering the regime, they are its auxiliary feature. The love affair between Kagarlitsky and the Kremlin has been developing over a long period now, and we can identify milestones in this relationship by a dotted line. Such revelations should really be followed by well publicised scandals. In 2008 Kagarlitsky wholeheartedly attached himself to the militaristic hysteria of the war against Georgia. At the time, the mainstream press called the people of Georgia ‘rodents’ [a play on the name of the nationality, gruzin, using the similarly sounding Russian word, gryzun, meaning rodent). The government called them ‘American marionettes’. Saakashvilli’s political gambling and overestimation of the country’s armed forces resulted in Georgia’s defeat. While Russia engaged in purposeful destruction of infrastructure in South Osetia, set fires to nature reserves, condoned ethnic cleansing of Georgian in the area, for Mr Kagarlitsky this was ‘anti-imperialist’ war of Russia against the US. As in the case with Ukraine, this Russian national socialist says a lot about the West but chooses to keep silent about the imperialist interests of Moscow. 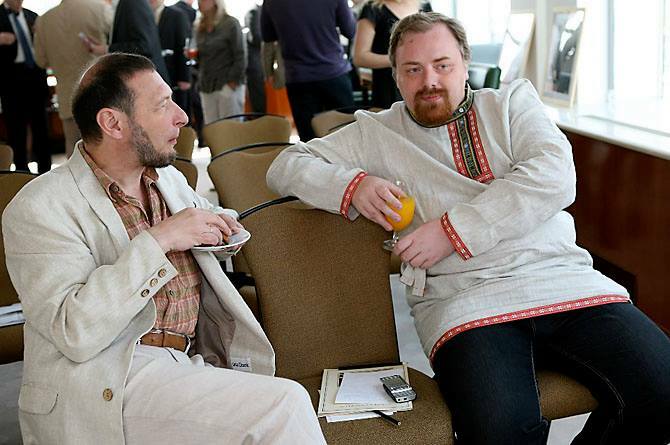 In 2009 there was a scandal around Rabko.ru. One of the employees of the project reported that the site has a direct relationship with Mr Gorshenin, who is connected withe the Presidential Administration and who, moreover, received a personal letter of thanks from [Sergey] Sobyanin [presently the mayor of Moscow, previously the head of Presidential Administration and before that the Deputy Prime Minister of Russia — HC] for his positive input into the election of Medvedev as the country’s President. Nobody seems to have paid any attention to this fact. For Moscow and its political atmosphere this is not especially sensational; among the capital’s Byzantine intrigues and insidious unscrupulousness receiving money from th government for ‘anti-capitalist’ activities has long ago become the norm. If you talk to Russian leftist about principles and ethics, you will soon learn many new and interesting things, such as that the majority of left-wing organisations have at one time or another been directly or indirectly involved in corruption. Those who try to diversify their sources of financing, or who are especially keen to maintain some principles may soon find themselves in prison. Just before the Maidan protests began Kagarlitsky spoke out against European association. His arguments would typically boil down to a claim that closer ties with the EU would result in the destruction of the Soviet industrial base in Ukraine. The problem is that this base is already utterly destroyed and no money has gone into its renovation. The Eurasian Customs Union would prolong agony of this process of destruction, but it would not provide chances for Ukraine to develop along the lines of a capitalist economy. The high energy consuming, backward economy of Ukraine would collapse one way or another, and the Kremlin’s ’Russian World’ is not a solution to this problem but, at best, an attempt to put it on the shoulders of the following generations. In this sense Kagarlitsky is defending not the interests of the workers, but those of the oligarchs. The latter have a choice as to when to leave this situation, should they see it fit: when it becomes completely impossible to sell the products manufactured at their factories they will transfer their assets into liquid form and invest the capital into something else. Most likely outside the country. And, they will incur minimal costs in doing so: after all, the assets they acquired during privatisation were valued at nearly nothing. On the other hand, the results of such ‘management’ and transactions of their assets will befall all those who depend on the fate of the Ukrainian manufacturing. It would be great if Western leftists could put on a wig and dark sunglasses, go to Russia and listen to the way Kagarlitsky, during his outing with the aforementioned crowd, speaks with a completely straight face about the good appointment that awaits him from the Kremlin soon. But this is unlikely. Kagarlitsky, like other ‘leftwing intellectuals’ massage the ‘anti-imperialist’ souls of their Western leftists, who understand the significance of geopolitics and imperialist contradictions, but who do not at all care about the lives of actual Syrians or Ukrainians, if that blood isn’t spilled in accordance with their (racist) views of what the will of these people ought to be in accordance with their formulations. All these Arab and Slavic barbarians are not worth the time that would be spent on them in conversations. On the other hand, translating Putin’s political theses into the ’Marxist’ language, Kagarlitsky and other such “Eastern European left-wing experts” help them come to terms, with European racist indifference, with the fate of the victims of ‘anti-imperialist’ regimes and ‘understand’ the Russian Emperor.